Simply Cups, the UK’s ONLY active cup recycling scheme, has launched a number of exciting new initiatives at its third Annual Meeting that includes an extended collection service, a host of new members and, most importantly, a range of functional products created from the post-consumer materials that the scheme is recovering. Key to the development of Simply Cups’ range of new products is the creation of a new durable polymer that has been produced using both the paper and plastic content of paper cups. Trials have shown that the composite is much stronger than conventional plastics and can be readily moulded into products at high speeds. 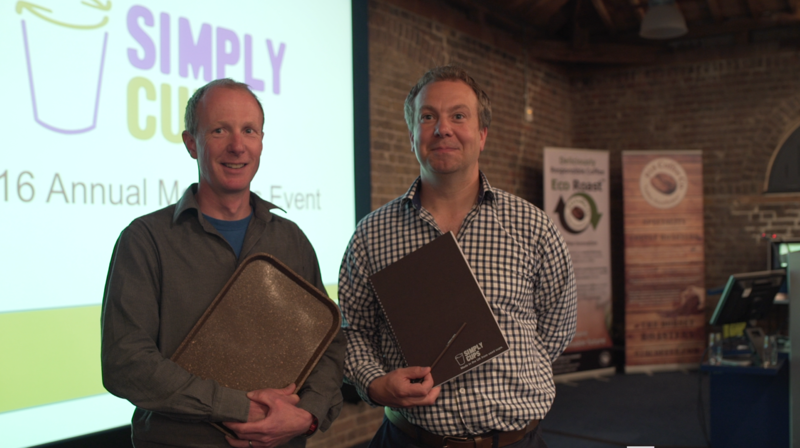 A partnership has been struck between Simply Cups and the creators of the polymer, specialist recycler Nextek and product designer and manufacturer AShortWalk, which will result in the launch of a wide range of new consumer products made from this breakthrough material and sold on the Simply Cups website. Items will include coasters, key rings, signage and wall clocks together with a host of other products made from recycled paper and plastics, such as stationery, office supplies and even clothing. “Since launching the scheme we have continually sought new applications for used cups and our partnership with Nextek and AShortWalk enables us to produce functional Simply Cups branded products from the materials we collect”. “Furthermore, this will enhance the credibility and value of the scheme to our Members who will now see a tangible return from their assistance in placing their used cups in the appropriate cup recycling bin. Most importantly, however, we aim to capitalise on the demand for locally manufactured products using locally, derived post-consumer material”. “Whilst we are delighted with the significant progress we have made to date, this will be a game changer for us as it will create the required pull for recycled products from the marketplace that will fund the further the expansion of the scheme”. The event, held at the Museum of London, was attended by over one hundred representatives from the UK’s leading hospitality and food service companies, including manufacturers, suppliers and well-known brands. Simply Cups has also announced a new, extended cup recycling service which means that, along with paper cups, the scheme will now be collecting and recycling Polypropylene (PP), High Impact Polystyrene (HIPS) and PET Cups. To reflect this change, a number of new cup manufacturers have now also joined the scheme and include Coveris (deleted The Paper Cup Company), Nupik Flo and RPC Tedeco-Gizeh. Waste management is constantly evolving – and so is our fleet!